EL.PI. CAST-RESIN – We manufacture dry type transformers (impregnated and cast-resin) and oil filled transformers. Mon - Fri 8,00 a.m. - 5,00 p.m.
(impregnated and cast-resin) and oil filled transformers. A modern factory and our highly skilled personnel enable us to manufacture high quality cast resin transformers. Technology and experience merge together to provide high quality products highly reliable over time. We sell oil filled transformer entirely manufactured by ELETTROMECCANICA PIOSSASCO founded ant the beginning of the 50's by Mr. Giacinto and his son, Eng. Alessandro Luparia. Our range of cast resin transformers include rated power from 50 Kva to 3150 kVA, with voltages up to kV33 in 36 kV insulation class. EL. PI. CAST.RESIN dry type tranformers are highly appreciated by customers throughout domestic and international markets for manufacture quality, efficiency and care. Our range of dry type impregnated transformers span from 25kVA TO 1600 kVA with voltages up to 3000 V, with the possibility of technical customization upon request. Stemming from the experience of Elettromeccanica Piossasco, established in 1962, EL.PI. CAST-RESIN, its subsidiary, launched in 2010 the manufacture of cast resin transformers. Thanks to its recent establishment EL.PI.CAST-RESIN counts on state-of-the art machinery to ensure the manufacture of transformers with the highest standards of efficiency. EL.PI. CAST-RESIN’s 2,500 sq. metres facilities include a 2,000 sq. 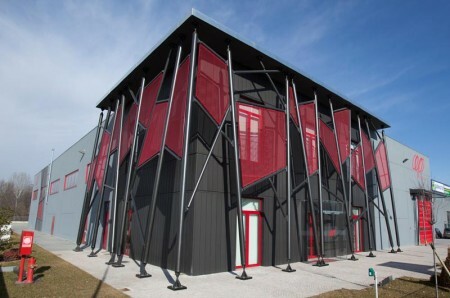 metres plant, offices, technical labs and changing rooms (500 sq.metres) and an outdoor 3,500 sq. metres stocking and delivery area with the possibility of future expansion. The special range of dry-type transformers impregnated with insulating red paint. The new series of dry-type encapsulated cast resin transformers with self-supporting enclosures. For any pricing enquiry please contact us through our information request form..